And here is Part 2. Not to bias you, but of today’s recipes, I think this one was my favourite. If you are familiar with the amazingness of Tagalongs (i.e. the Girl Scout cookie), these are a similar concept. Peanut butter oozing out from under chocolate topping. Fabuloscity. 2. Melt the unsweetened chocolte in a double boiler over barely simmering water and set aside. Sift together flour, salt, soda, and baking powder in a medium bowl. 3. In a large bowl, cream butter and sugar with an electric mixer. Beat in melted chocolate. Beat in egg and vanilla. Stir in flour mixture until well mixed. 4. Shape dough into 1 inch balls. Place balls on cookie sheets about 2 ½ inches apart. Make an indentation in the center of each ball of dough with your finger(s). 5. Beat peanut butter and powdered sugar together. Spoon about a teaspoon of peanut butter mixture into center of each cookie (in indentation). 6. In a double boiler over gently simmering water, melt the chocolate chips. Remove from heat and stir in condensed milk. 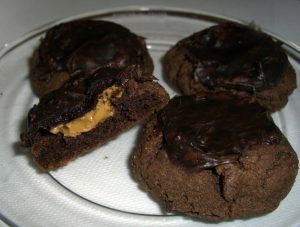 Working quickly before it stiffens, spoon chocolate mixture over center of each cookie so that it covers peanut butter. Use your finger or a spoon to make sure peanut butter is sealed in. 7. Bake cookies for 10 minutes. Let cool on sheets for 2 minutes. Transfer to wire racks to cool completely.